As Hannibal, from the popular TV show back in the day the “A Team” would say, “I love it when a plan comes together,” and that’s exactly what happened today. I met up with a friend, Kim Sayles whom I saw a few days earlier and when I told him I started this blog he said, “I have a place for you…you are going to die.” Little did I know he was also a fragrance enthusiast. We met on the border of Soho and Nolita and hit up a few stores. Kim knows all the spots, as well he should. Working in fashion and home furnishings, he’s a magnet for what’s chic. Just to show you how bizarre of a day it was, we’re standing on the corner of Prince and Lafayette and he tells me he’s thinking of buying a place with his partner and out of nowhere someone says, “wait three years.” After standing there and talking to this seemingly strange guy in all leather with gold rings, it turns out we’re talking to Mark Fisher (a big time photographer). Anyhow, we made our way over to 9 Christopher Street where I entered the pearly gates of fragrance heaven. 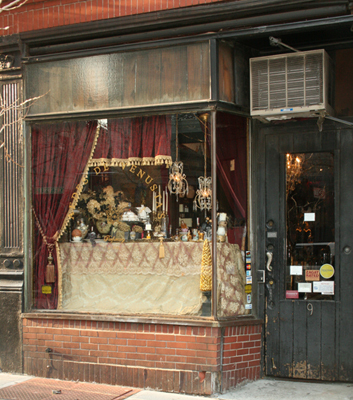 Aedes De Venustas is an unassuming store on a very quaint block. Upon entering the store you quickly realize this place is for the serious fragrance appreciator. It feels like every inch of the store is taken up with beautifully crafted bottles of liquid crack. There is absolutely nothing “run of the mill” there. I was graciously greeted by Robin and the love affair began. We must have spent about an hour smelling different scents, discussing notes, preferences, blending and it really got friendly when Robin and Kim discovered they were both Aries. The staff is very knowledgeable and quite patient. We were having so much fun that after a half hour we realized we had yet to exchange names. I must have smelt at least 4 different takes on Rose and each were masterfully blended and evoked very different emotions. I could go on and on but if you are really and must stress REALLY looking for a fragrance that is unlike anything you’ve ever experienced Aedes De Venustas is the place for you. I already know what my next few purchases will be. I will admit, I couldn’t leave there empty handed…more about that later.